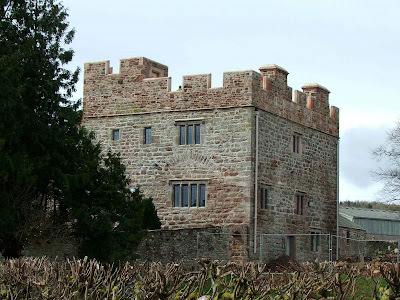 Blencow Hall consists of a rather spectacular pair of towers with a gatehouse and attached hall. This site is situated about a mile and half North of Greystoke, and openly visible from the road side. 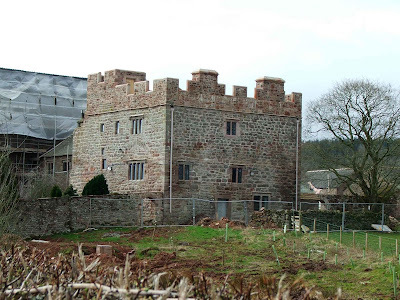 Just my luck on the day I visited, the builders had moved in and covered the gatehouse and the Southern tower with plastic and scaffolding. Hence I can only provide photos of the newly renovated Northern tower. The Southern tower (not shown here) was built in the early part of the 17th century, by Sir Henry Blencow. The Northern tower (shown above) was probably erected some time in the late 15th century. Its walls are around 1.2 metres thick. There is a spiral staircase in one corner, and up until the renovation was completed, the battlements were missing. As you can see from the above photo, these have now been replaced completing the look of the tower. About 2 and a half miles to the East, the site of Blencow Old Hall can be found. This site would have been the original seat of the Blencow family, probably dating from the late 12th or early 13th century. The site would originally have been a moated tower house. All that can be seen today, is a very feint rectangular outline in the field next to the road leading to Newton Reigny. The remains perhaps measure some 30 feet by about 15 feet. There would originally have been a moat surrounding this tower, but this has long since been filled in. 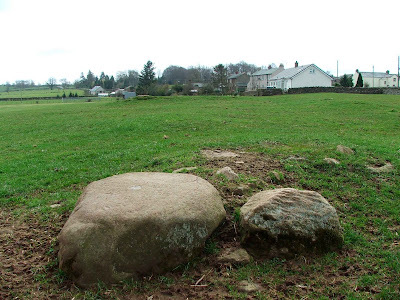 Large boulders mark the North Eastern and South Eastern corners, with only rubble and slight crop marks marking the remaining footings. The footings can be seen in the field next to the road, and can be accessed through a stile in the wall. How do I make contact with Matthew to gain permission to use a couple of his copyright photos of the Old Blencowe Hall? Thank you so much for the wonderful pictures of Blencow Hall. I am a descendent and live in NY, America. I am hoping to make a trip there in June for the Blencowe family reunion and cant wait to see the area.